The list of hardware he's held or owned during his illustrious career is commiserate with his statistics. 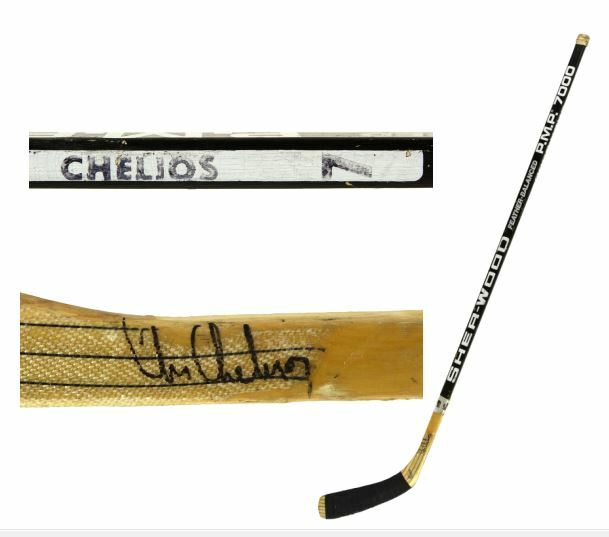 An outstanding amateur player, Chelios was a member of the University of Wisconsin's NCAA Championship team in 1983 and a member of the 1984 US Olympic team. He was drafted with the 40th pick by the Montreal Canadiens in 1981. He played there for seven seasons starting in 1984 where he would finish as the Calder Memorial Trophy runner-up to Mario Lemieux having tallied 64 points in 74 games. He was named to the All-Rookie Team and played in his first All-Star Game. The following year, he won his first of three Stanley Cups. 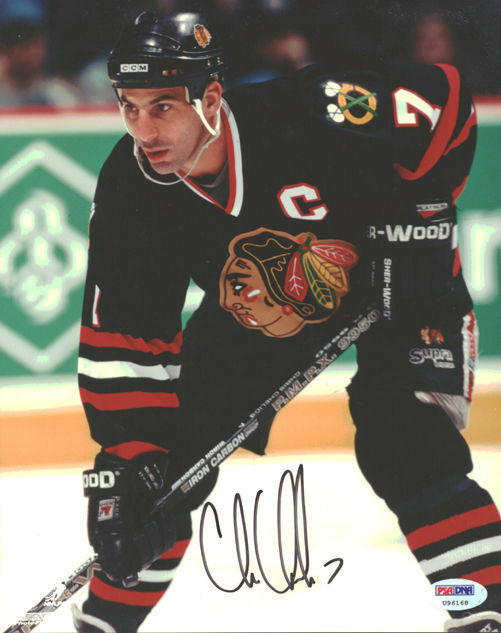 Chris Chelios would go on to play for the Chicago Blackhawks (1990-91 to 1998-99)and the Detroit Red Wings (1998-99 to 2008-09) before playing a final season with the Atlanta Thrashers in 2009-10. A fan favorite wherever he played, his knowledge of the the sports' long history, his ice presence, and gifted two-way play endeared him to fans long after he had left a team. 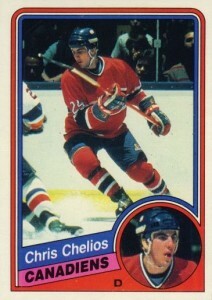 Most Chris Chelios cards remain affordable. Outside of his lone rookie card, collectors will want to take a close look at his autograph cards. 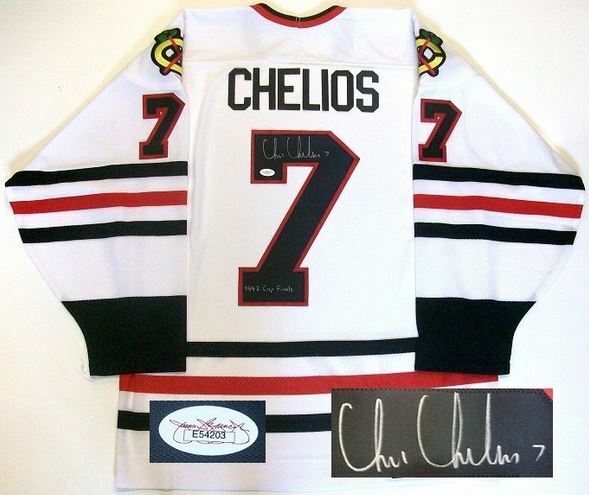 Given the length of is career, there are relatively few Chris Chelios autograph cards, especially fully licensed ones. Despite having only one rookie card, Chelios' longevity in the league means he has plenty of other cards, autographs and memorabilia for collectors to pursue. Cards from the 1984-85 O-Pee-Chee Hockey set often suffer from centering and edge wear issues. Finding a high-grade Chris Chelios rookie card free of these defects can be a challenging task. Most often samples can be found free from one but not both. Chris Chelios 1996-97 Donruss Elite Perspective #11, 007 500 Jersey Number! The letters "C-H and l" are over-sized. The letter "C" is discernible and flows into an equally legible letter "h."
The letters "r-i-s" are implied. The last name starts the same as the first. The letter "h" flows into a legible, closed loop letter "e."
The letter "l" is a tall open loop. The letter "i" is visible with no dot. The letters "o-s" are implied.